One of the most fun things I cover is idioms. They're common expressions that you hear every day - things like "Wow I'm drenched - it's raining cats and dogs out there!" or "don't worry about that now - we'll cross that bridge when we come to it." The students have heard many idioms, but they don't know exactly what they mean. 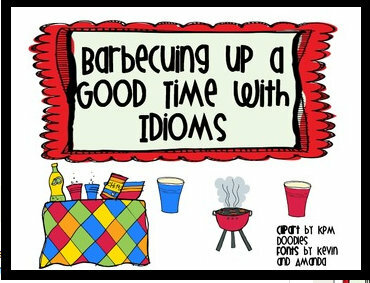 Last year I covered idioms for 2 days, but the students (and me!) loved them so much that this year I decided to do a week-long unit on them. 1. 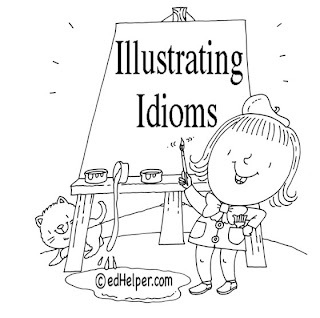 "Illustrating Idioms" Smartboard file - this is a wonderful children's book that defines what an idiom is as well as giving many common examples and explaining what these really mean. I read it to the class on the Smart Board, but you could also print it out and copy it for the kids to follow along as you read and discuss. 2. After we've discussed what an idiom is and common examples, I give them each a slip of paper with an idiom on it. They then have to draw a picture of what the sentence literally says. Then they write a sentence telling what the idiom figuratively means. For example, the picture of "you're pulling my leg" would show a boy literally yanking on his friend's leg. Then they would write "you're pulling my leg means that you're joking or teasing me." 4. Idiom matching partner game: I bought two sets of plastic cups (1 blue, 1 red). One the blue cups, I print labels with common idioms on them. On the red cups, I put labels with the answers, or what the idiom means. With a partner they match the blue cups with the red cups and fill out this " I got the idea from Teaching to Inspire in 5th and you can access the FREE TPT link here: Barbecuing a Good Time with Idioms but instead of printing out the cups, I used real cups that can stack together. *If you want a copy of my labels, please leave me a comment and I'll send them to you. 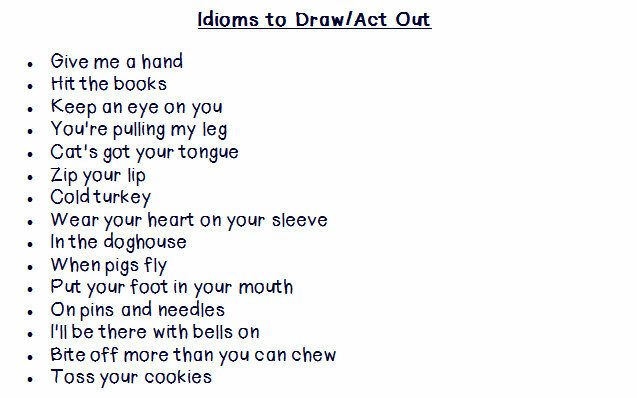 I intentionally use a lot of idioms in class this week and in the following weeks for the students to be exposed to them. 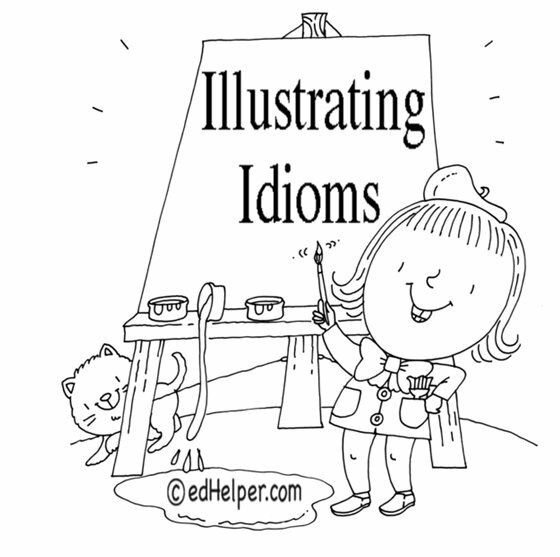 Whenever I say one, if a student catches it, he/she can raise their hand and say "idiom!" and I reward them for paying attention and remembering. If ever a student doesn't know what an idiom means, I try to use it in a sentence or give an example before I just tell them outright what it means. Idioms are particularly difficult for my students whose first language is not English, so they need extra support and explanations. 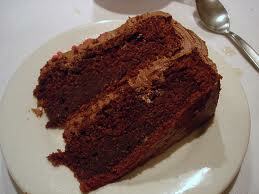 I highly encourage you to incorporate idioms into your classroom schedule - don't worry, they're a piece of cake!